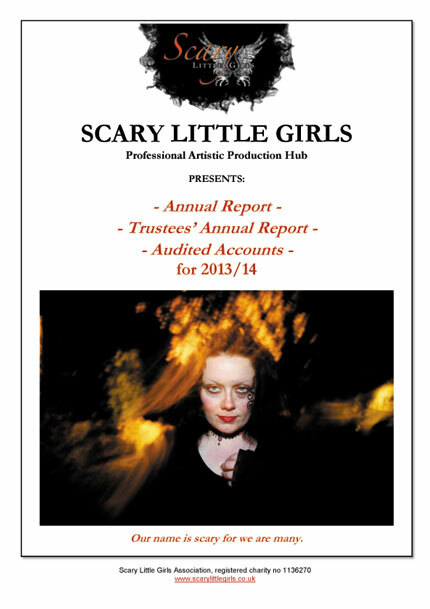 Scary Little Girls » News » Uncategorized » The SLG Annual Report is here! We’re delighted to present our very first full Annual Report, which covers 2013/14 and a little beyond. It outlines SLG’s work in that time as well our broader mission and future plans; showcases some of our lovely artwork; highlights key collaborations; and generally shows you all the amazing stuff we get up to! You can also delve deeper into SLG’s charity structure and finances with the Trustees’ Annual Report and Audited Accounts for the period. Huge thanks to our Trustee Tricia Norton for pulling it together and doing all the hard work!